In New York City, a BID is a geographic district within which there exists a partnership between the public sector and the private property and business owners who are physically located within the BID’s geographic boundaries. In these public/private partnerships, the private property and business owners collectively choose to contribute financially to provide their commercial district with enhanced maintenance and other services, which vary depending upon the unique needs of each BID. The proposed Greater JFK IBID seeks to improve the under-served, yet economically significant geographic area surrounding the JFK Airport. According to a press release, the proposed IBID’s 4.1 million square-foot scope encompasses more than 600 businesses, such as “customs brokers, freight forwarders, messenger and logistical services, trucking and maintenance companies, and many others.” In addition to these cargo-related businesses, the area is occupied by retail shops, community services, and hotels, which, in conjunction with the cargo-related businesses, collectively employ approximately 8,000 workers. Further, the Greater JFK IBID would serve over 150 single-family homes. 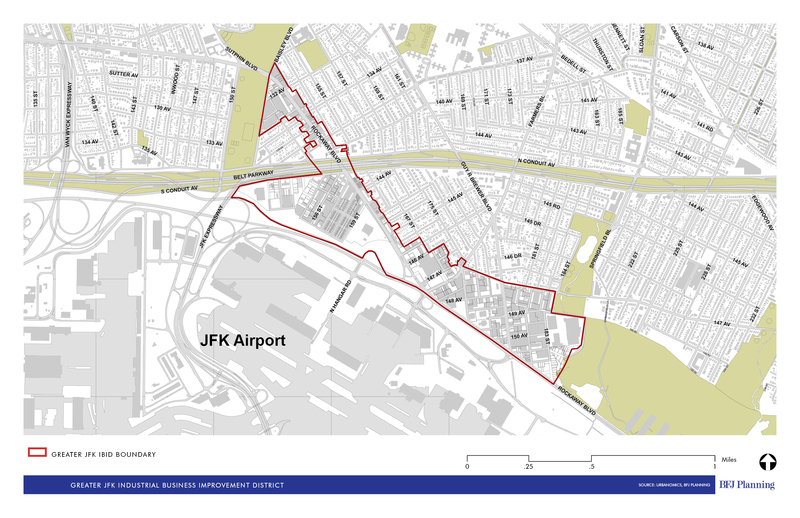 Although the JFK Airport itself is not included within the boundaries of the proposed IBID, the Greater JFK IBID’s geographic scope and proposed annual budget would both be the largest of any other IBID in the City. At the April 13th hearing, City Planning Commissioners voiced concerns primarily over the Port Authority’s lack of involvement in the IBID planning process and the JFK Airport’s exclusion from the geographic boundaries of the proposed IBID. Michael Blaise Backer, Deputy Commissioner for Neighborhood Development at the New York City Department of Small Business Services, testified that the IBID seeks to address the challenges faced by the under-served area surrounding the JFK airport, rather than the airport itself. Within the proposed IBID’s boundaries are approximately 600 businesses, which are responsible for ensuring the smooth flow of goods through the airport. City Planning Chair Carl Weisbrod views the Port Authority’s role in the Greater JFK IBID as central to the IBID’s success in advancing the JFK Airport’s status as a major cargo destination. He questioned Backer about why the IBID’s boundaries stop just short of the airport, and why the Port Authority is not more formally involved in the IBID process in general. Backer testified that the Port Authority participated in the decision-making process that determined the boundaries of the IBID and thought the off-airport community would be better served if the Airport were not included within the boundaries. Backer continued by testifying that pursuant to BID law, since the JFK Airport is not within the proposed IBID’s boundaries, the Port Authority cannot vote on matters pertaining to the IBID. Commissioner Larisa Ortiz noted that the budget for the proposed JFK IBID would be larger than any other IBID in the City, and it emphasizes significantly building up the IBID’s infrastructure. In Commissioner Ortiz’s view, the formal inclusion of the Port Authority in the proposed IBID would be critical in funding the abnormally large budget, though she questioned Backer about whether the proposed budget is large enough to accomplish its goals. Backer explained that the large size of the budget is due to the larger geographic area covered by the proposed IBID. In addition, Backer noted that due to the high density of the commercial usage within the proposed IBID’s boundaries, the Greater JFK IBID would include more tenants and property owners than other IBIDS in the City. According to Backer, while there will be more contributors involved in the Greater JFK IBID than other IBIDs in the City, this means that the proposed IBID’s success would also require a larger maintenance and administrative staff, which is accounted for in the large proposed budget. Barbara Cohen, BID consultant to the Greater JFK IBID’s Planning Committee in association with BFJ Planning, Inc., described the planned usage of the Greater JFK IBID’s proposed annual budget of $500k as unique to the needs of the off-airport area surrounding the JFK airport, such as the need for project managers engaged in implementing and maintaining the JFK IBID, and other typical administrative expenses, including office space and insurance coverage. According to Cohen, representatives from a variety of industry associations are on the Planning Committee to represent the needs of the off-airport commercial industry. Commissioner Ortiz noted that 20 percent of the Greater JFK IBID’s proposed budget is set aside for “public safety and security,” yet these needs are not mentioned in the proposal as being of priority. Cohen described the safety and security needs by explaining that “catalytic converges seem to disappear from trucks,” which considered together with the pedestrian safety issues affecting the residents and commercial tenants, had sparked a discussion about the integration of cameras and streetlights into the operations of the proposed IBID. Frank Liggio, commercial real estate broker at CBRE, testified as the representative of RREEF America Reit II, which is one of the four institutional investors that collectively own more than 40 percent of the total property lots within the proposed Greater JFK IBID and would contribute more than 50 percent of the IBID’s budget. Liggio testified that the Port Authority and the New York City Economic Development Corporation commissioned a study several years ago to figure out how to improve the cargo community, and from this study spawned the idea to form an IBID. Chair Weisbrod questioned Liggio on whether a tension exists between what happens at the airport and off-site. Liggio testified that, “there’s clearly a symbiotic relationship between the two communities; however, there’s never been once voice for the off-tarmac world to say, ‘we have a problem here.’” According to Liggio, 80 percent of the 1.3 million tons of cargo transported through and via the JFK Airport touches the area contained within the proposed Greater JFK IBID, because many of these off-site businesses act as intermediaries between airlines. Liggio continued by explaining that both the on- and off-tarmac communities are “dysfunctional,” but the Port Authority is more focused on improving its passenger capacity, which has increased 20 to 30 percent within the last five years and brought in billions of dollars in investments into its terminals. This has taken the Port Authority’s attention away from the cargo terminals, and the newest cargo terminal was built in 2003. Therefore, the proposed Greater JFK IBID is all about bringing cargo-related business back to the area by increasing its effectiveness and ramping up related marketing efforts to support the cargo-business community. David Hopkins, Director of Aviation at the New York City Economic Development Corporation, testified expanding on the findings of the study mentioned by Liggio. According to Hopkins, the study aimed to find ways to ameliorate the conditions that have been causing a decline in the volume of cargo moving through the JFK airport. The study, which was released to the public in 2013, focused on ways to improve facilities, business practices, and marketing efforts, the solutions to which are laid out in a 22 point “action agenda.” One of the items on the action agenda is to create an IBID for the greater JFK area, which EDC initiated by providing the seed money for the creation of the Planning Committee. The Port Authority took on its own set of tasks, which include modernizing its on-airport facilities and opening the first airport truck stop in the City. Commissioner Ortiz noted the likely need for a “large infrastructure investment,” which would require the “right people at the table who are in the position to help fund these large projects,” and pointed to the Port Authority as the deep pockets likely capable of satisfying this need. Hopkins testified that the Port Authority was highly involved in the planning process that led to the currently proposed Greater JFK IBID, and a number of ideas were discussed on how the Port Authority could contribute, such as by providing a shuttle service to connect the off- and on-airport communities. However, Hopkins testified that the businesses located within the proposed Greater JFK IBID tend to take a “very hands-off approach” and “keep their heads down and do their jobs.” For this reason, the bigger needs to be served by the Greater JFK IBID are the “management and advertising of the key infrastructure investments,” rather than the investments themselves. On March 21, 2016, Queens Community Board 13 unanimously approved the proposed Greater JFK IBID. Queens Community Board 12 approved the proposal with 33 members in favor of the proposal, one member against it, and one abstention. On April 18, 2016, the Queens Borough Board unanimously approved the proposed Greater JFK IBID. CPC: Greater JFK BID (160225–BDQ) (Apr. 13, 2016).